Today I joined a group of people on a walk around a park. It was part of a project by Lifeline called "Out of the shadows and into the light", with the aim of raising awareness and getting people to talk about suicide. The Penrith event was organised by my friends Jay McGarrity and Jess Morton, and they have to be congratulated. 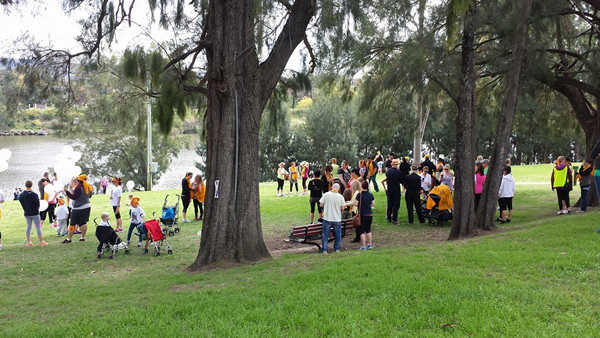 I've been involved with this project for about four years now, and at the first walk all the people who attended were able to be seated around a single table at the Nepean Rowing Club afterwards for a beer and lunch. This year more than 100 people came along. Several people who had been touched by suicide spoke to the group before we set off walking, telling their tales of personal desperation and family loss. I was going to give one of the talks, but I decided to refrain. Here is what I would have said. It is important to talk about suicide, to bring it out as the slogan for today says "into the light". It has been a taboo for too long, but by removing the stigma it will become possible for those in the depths of despair to reach out without shame or embarrassment, for listeners to respond with sympathy and help, not criticism. At a government level, millions of dollars are spent each year on road safety but the number of suicides is twice the road toll and mental health is a low priority. Actions like this one today will help to break down the taboo and hopefully lead to this very serious social and health problem getting the attention, and answers, that it deserves. It also shows that families who have been affected by suicide are not alone and that there are others who understand and sympathise with their pain and loss. 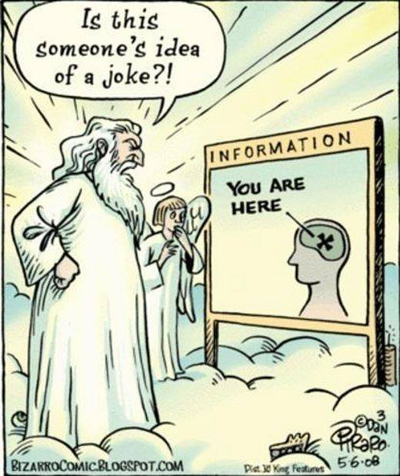 When I did my link check on this site this month to find links that have gone or moved I discovered that Bill Mutranowski's Atheist Cartoons has disappeared. I wasn't too surprised at this, because I couldn't find it when I went looking for updates a few weeks ago, and the last time I saw it it looked like it hadn't been updated for a while. 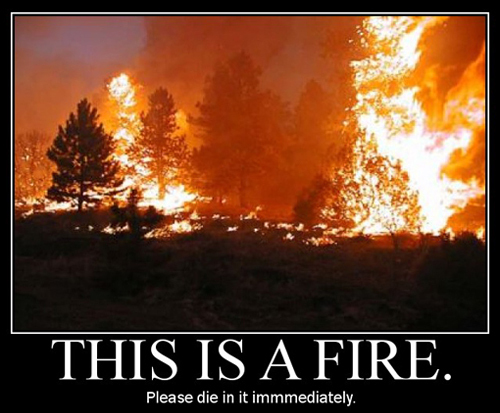 A Google search turned up another site calling itself by the same name but it was just a tumblr collection of stolen and unattributed images, some of which had a gaucheness and stupidity that made me feel like going to church. It is the sort of thing that allows believers to say "Atheists can't think and have nothing to say". Now to fix the 23 links from here to there. And here is the first of the cartoons I ever used, in September 2008. The remnants of the band Queen are currently touring Australia (with the replacement for Freddie Mercury getting a surprisingly good reception from fans - he really is excellent) although I wasn't able to see them in Sydney. My disappointment has been heightened, because I would have loved to sing along with "Another One Bites The Dust". The reason for this is that my link check showed that the web site for the Canadian Cancer Research Group is no more. It is dead, has fallen off the perch, and has gone to join the sewer invisible. For those unfamiliar with CCRG, it was the web site of Mr William P O'Neill who did the world a favour by dying in March 2013. Here is the condolence message I posted on his family's memorial site. For thirteen years this vile creature published lies about me and my family, using the foulest language known to man. He contacted businesses and organisations I could be connected to and lied to them about me. He used to pop up on almost any blog or forum where my name was mentioned and say disgusting things about me. 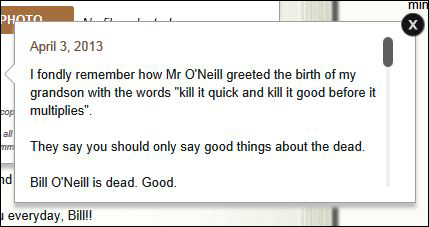 The fact that he caused the early deaths of at least two people but used them in advertising (and at one stage pretended to be the husband of one of them when he emailed me) shows the depth of his vileness. You can see the record of his interaction with me here, including the mass of email and Usenet messages he created (many of them with a transparent anonymity). The registration was updated in February this year and is current until the end of January, 2015. 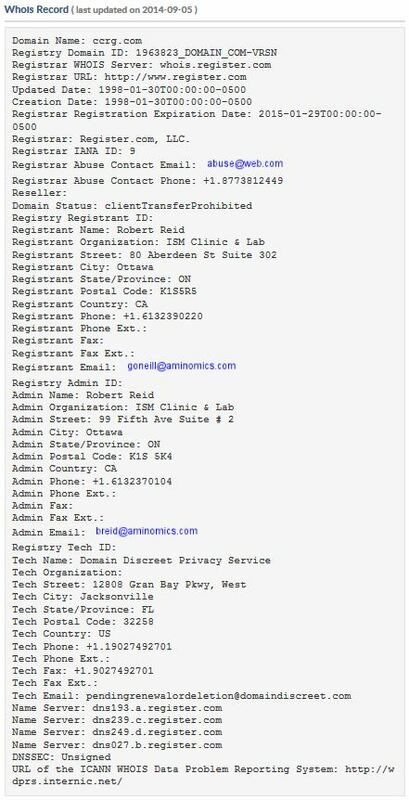 The registrant has the email address goneill@aminomics.com and the web site associated with that domain name appears to be a retread of the CCRG site using the name "Immune System Management" that Mr O'Neill had been moving towards just before his timely death. It looks like the family is continuing the tradition of lying in order to steal money from desperate people. I wonder if I can get the current owners to also continue the tradition of stalking me. Perhaps I should send an email to "goneill" asking whether I should archive all the CCRG material here or expect to be able to expand it in the future. This advertisement is one of a series appearing on public transport in Concord, New Hampshire. Except for the fact that it is almost impossible to grade anti-vaccination liars because they are all as bad as each other, the National Vaccine Information Center probably ranks near the bottom because of the word "Information" in their lying name. 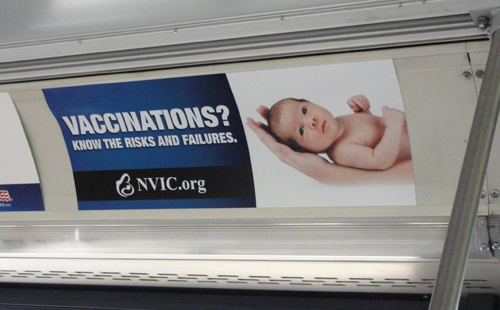 Here's another image that Barbara Loe Fisher of NVIC and her fellow anti-vaccination liars might like to consider. September was a big month for me appearing in magazines. There was my usual Naked Skeptic column in Australasian Science magazine, and I also appeared in the Forum section of The Skeptic. (You can click on the respective magazine covers to read the scribblings.) I must admit that getting (un)dressed to write the former was much easier than finding a laurel wreath and toga for the second, but getting into character is important. I had to give even more consideration to how I dressed for my appearance in the third magazine, because it is one almost completely devoted to how people look and present themselves to the world. Yes, folks, I appeared in Vogue Australia. Yes, that Vogue! The one full of models in very expensive clothes, with their images interspersed between advertisements for jewellry and perfumes with prices that approach (and many times vastly exceed) what I paid for my car. My friends immediately launched onto Facebook to speculate about whether I had taken up a new career modelling while they simultaneously (and with extreme caution) hinted that my body morphology does not fit the ruling paradigm for the trade. There was also speculation that Vogue was semaphoring a change in fashions, with my usual ensemble of Dunlop Volley shoes, $12 jeans from Target and Hawaiian shirts becoming the new black. Peter Bowditch, a spokesperson for the Australian Skeptics, says earthing is basically pseudo science. "Grounding is just another thing on the pile of untested, unlikely and unworkable forms of alternative medicine," Bowditch says. "If the claim that people were healthier in the past because they ran around barefoot is true, then it is hard to explain why life expectancy now is so much greater than it was centuries ago." The next paragraph started with the question "So who to believe? ", and I can only hope that the readers choose me. You can read the article here, or you could even go to your newsagent or the Vogue web site and buy a copy of the magazine. And the differences between the magazines. Well, Vogue has a lot more pages (the table of contents is on page 60) and has a lot of glossy advertising pages. The cover of Vogue has a much prettier lady on it, although this is probably fair enough given the market and using a cover like that on either of the other magazines would send wrong signals and probably attract rage blogging about misogyny in the skeptic and scientific communities. I can read most of the content of Australasian Science and The Skeptic with interest, but much of the Vogue content doesn't interest me at all - note that this is not a criticism of the magazine, because it addresses a totally different market and is quite successful there (both the other magazines would love to have Vogue's circulation). And the back covers - an invitation to subscribe, an invitation to a convention, or an invitation to buy watches and trinkets from Cartier. It's a different world out there. 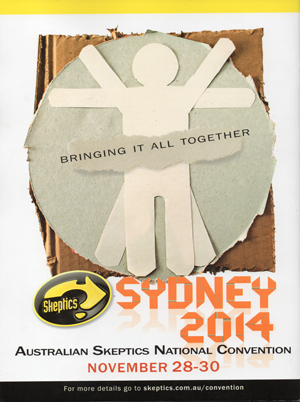 The Australian Skeptics National Convention will be held in Sydney in November this year. The October edition of Australasian Science magazine is in letterboxes and newsagents now. Once again, I'll nag you to buy a copy, or better still subscribe. It is without doubt the most readable and informative popular science magazine in Australia. This month's Naked Skeptic column is about the way that the opponents of reason don't seem to want to challenge their critics by using better science these days, but prefer to go straight to lawyers and courts. This can have a severely restricting effect not only on commentary but also on the sort of matters which people might choose to investigate, with some areas of research possibly being perceived to be too contentious to take on. The usual term to describe this is that it is a "chilling effect". I find extremely worrying that the direction of research can be dictated not by ethical or legislative considerations, but through the possibility of hurting someone's feelings or damaging someone's shonky business. Next month's column will be about a food fad now being heavily advertised on television suggesting that the product is different and healthier when there is no real difference at all. I won't publish it here until it's on the newsstands which will be towards the end of October. 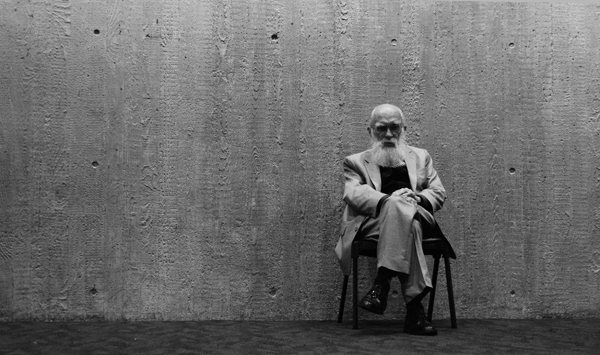 Another thing I've been writing that will be published later in the year is my interview with James Randi about his life and times. This will probably appear in the December edition of Australasian Science. Randi will be touring Australia in December. And all that writing is why there's not much else here this week. Things will be a little rushed next weekend, because I will be spending Saturday on the official Australian Skeptics stand at the Australian Paranormal and Spiritual Expo. Yes, you heard me correctly. 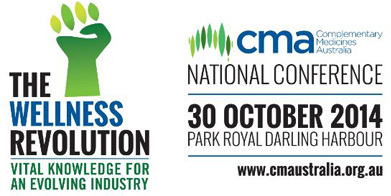 It's at the Casula Powerhouse and if you can get there please drop in and introduce yourself. I have already been asked by someone if I will read her aura, but that is just one of my minor paranormal skills. Come along. Be amazed. I have been supplied with a scientific paper published in a scientific journal with the title "Efficacy of a Homeopathic Complex on Acute Viral Tonsillitis". The journal is the Journal of Alternative and Complementary Medicine, which might very well have the stature of Nature or JAMA but might equally be the sort of publication which adds gloss and credibility to dubious research about dubious topics. I will leave my analysis of and comments about the paper until after I have had a chance to see whether the investigation really did lead to the conclusion that "The homeopathic complex used in this study exhibited significant anti-inflammatory and painrelieving qualities in children with acute viral tonsillitis". I have had experience in the past of how some homeopathy researchers seem to have attended statistics courses which differed greatly in content from the ones I did at university, but like a true skeptic I will reserve judgment until I have had time to gather the facts. In the meantime, I will rely on conventional treatments if any of my family come down with viral tonsillitis. After all, the paper does say "a definitive conclusion cannot be reached".